Kidnapped by Kivas Fajo, Data became part of an impressive collection of rare and one-of-a-kind items. 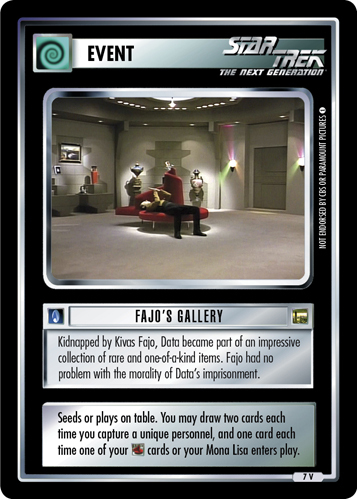 Fajo had no problem with the morality of Data's imprisonment. Seeds or plays on table. You may draw two cards each time you capture a unique personnel, and one card each time one of your cards or your Mona Lisa enters play.